I have emerged from the bubble that is Certified Cicerone studying. While I’d been studying on and off for the last year and a half, I cracked down on myself big time last Fall. I took the test a month ago and I’m currently waiting on my results which feels like a kid staring at their Christmas presents and being told to wait 4-6 weeks to open them. Patience is a virtue I do not naturally possess. Without exaggeration, I’ve done nothing in the kitchen since last September aside from scramble some eggs and reheat frozen pizza. The time it takes to study for the Cicerone test requires putting a certain percentage of your life on hold. Because I decided to skip half of high school, not take my SATs and procrastinate getting my Associates Degree over five years, let’s just say studying comes about as naturally to me as patience. I can also tell you that I’m more proud of surviving this test than most anything I’ve ever done. The real question is can I survive waiting a couple of weeks longer to see if I have officially become a beer expert. Killin’ me, Smalls. 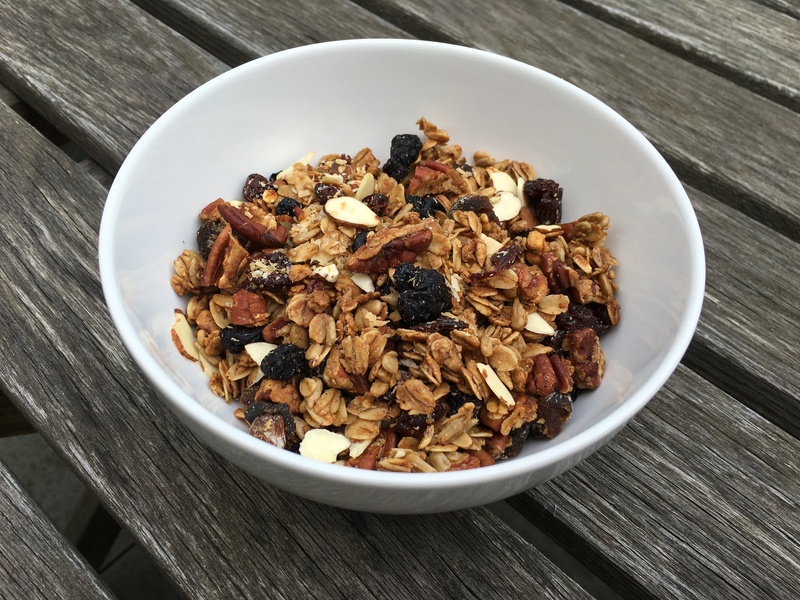 One recipe that I’ve gone back to time and again is granola. I’ve played around with so many variations of it and each one has been awesome for its own reason. The recipe I share with you here is my favorite iteration and one that I feel is just about perfect. It makes a lot so you’re more than welcome to scale back. However, you should heed my advice when I say you’ll kick yourself if you don’t have a bunch of this at the ready for snacks, breakfast, on top of ice cream or on a hike because it’ll disappear faster than you’d admit. With all the beer I’ve consumed over the last six months, it felt good to put something other than booze in my body. Why Radiohead? Two reasons. One, they’re my favorite band on earth and I shamefully have never posted a recipe involving them. Two, I go back to comforting places in my head and heart when I’ve been through something challenging. While their Pablo Honey album is by no means my favorite, it’s the album I’d play over and over when I was 13 years old and growing up was hard. I wish I could tell 13 year old Valerie that growing up is still hard at 37. Line a baking sheet with parchment paper. Toast almonds in the oven for 8-10 minutes. Set aside in a medium bowl. Re-line baking sheet with fresh parchment paper. 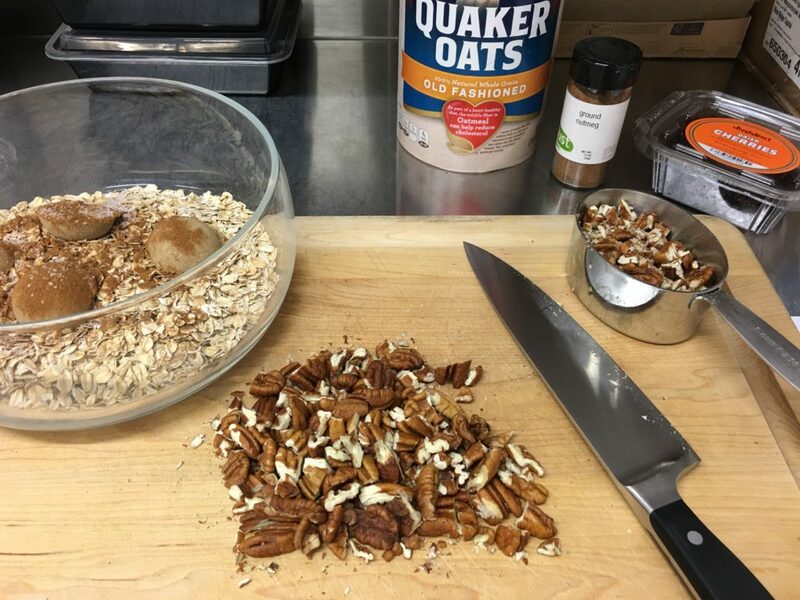 In a large bowl, combine the oats, brown sugar, cinnamon, nutmeg, salt, chopped pecans and sunflower seeds. Mix well with a fork, breaking up the brown sugar as much as possible. 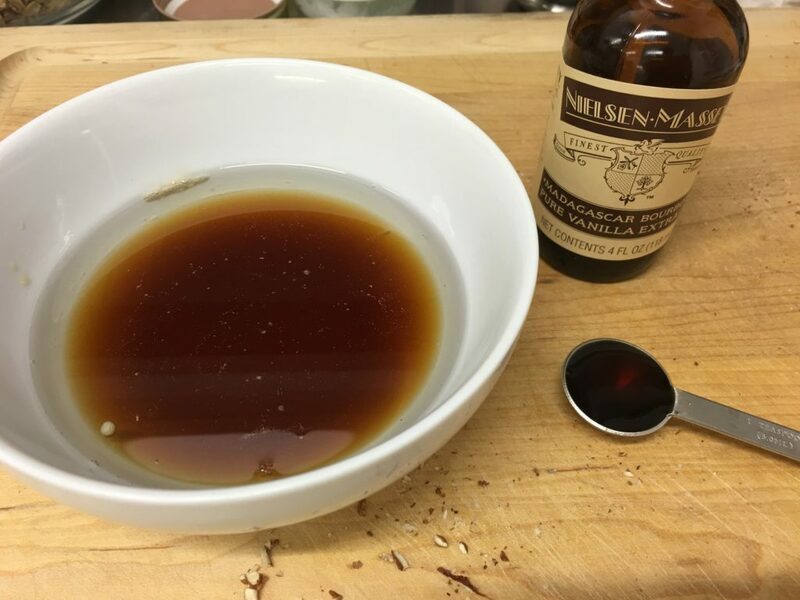 In a small bowl, combine the coconut oil, maple syrup and vanilla. Whisk together well and add to the bowl of oats. 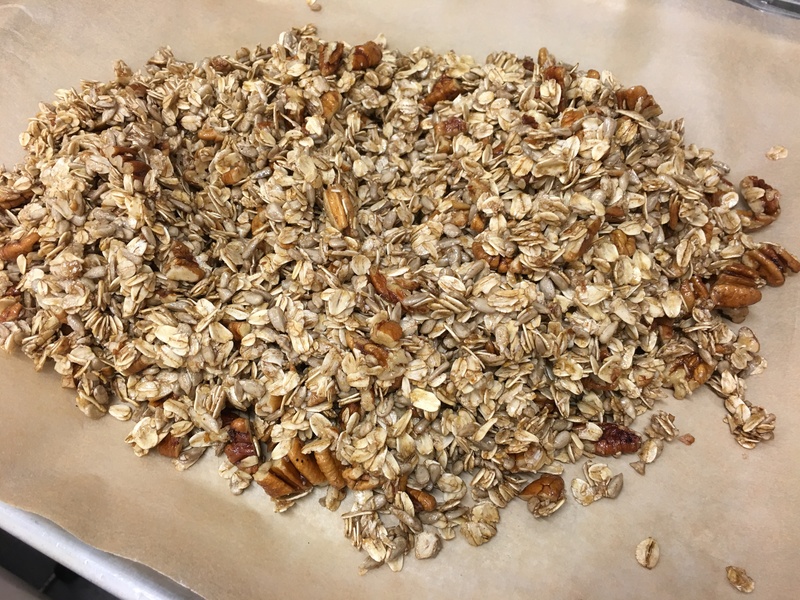 Mix well with a spatula until all of the oats are coated, making sure to scrape the sides and bottom of the bowl well. 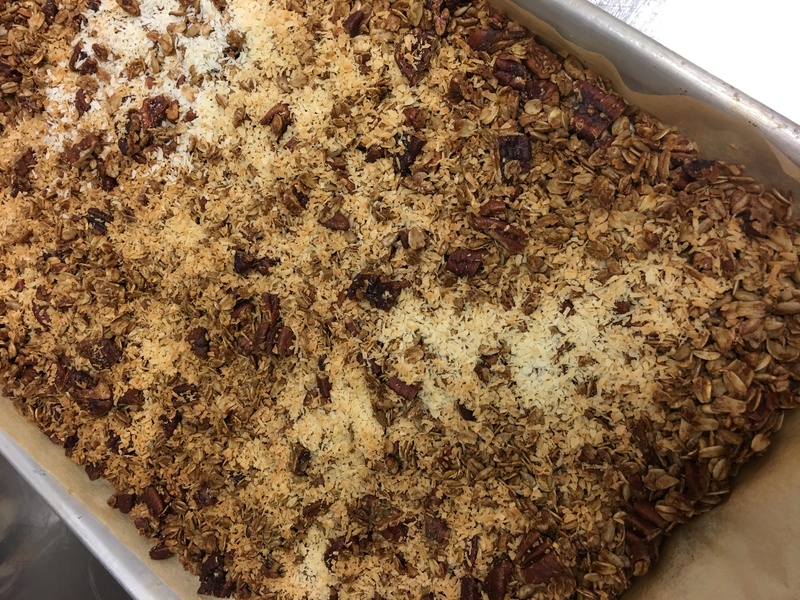 Spread mixture evenly onto prepared baking sheet. Bake for 10 minutes. Stir mixture, spread evenly again and bake for another 10 minutes. Repeat one last time, baking for another 10 minutes. Sprinkle coconut on top and bake for only 2-4 more minutes until coconut is lightly toasted. Note that coconut can burn very quickly so keep an eye on it. 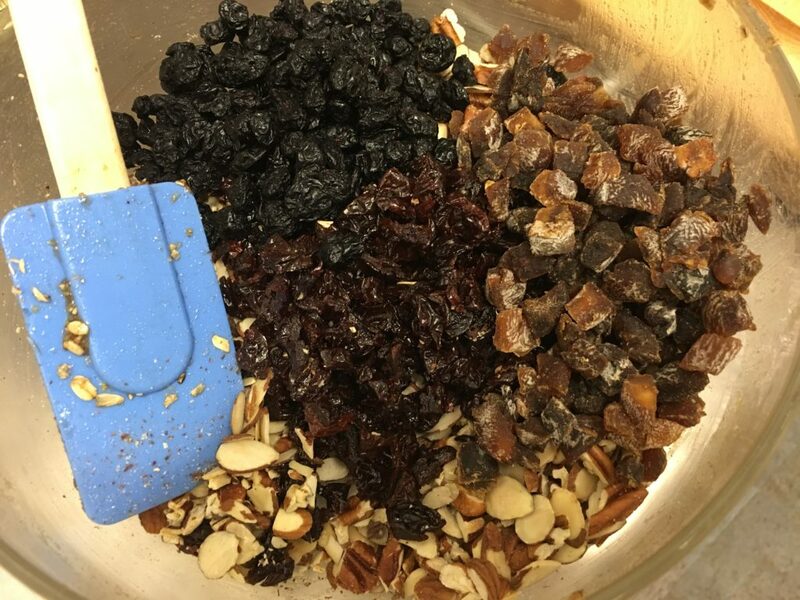 While granola is baking, chop cherries and apricots and add all dried fruit to the bowl of almonds. Stir to combine.